Good news for Tron fans. According to the Hollywood Reporter, commercial director Joseph Kosinski is in final negotiations to direct a sequel to the 1982 cult movie classic. Steven Lisberger, who co-wrote and directed the original film, has signed on as a producer. Kosinski, who last month signed on to In case you didn’t see the original film or have forgotten the plot (after all it’s 25 years-old now), Tron was about a computer programmer who gets sucked into a virtual world and forced to fight in his own video games. In 1982, the special effects used in Tron were groundbreaking. It was the first movie to use computer generated images (CGI) in conjunction with live action. Sources also say that visual effects personnel, for many of whom Tron was an inspiration to enter the business, are already are jockeying to work on the film. Good news for In case you didn’t see the original film or have forgotten the plot (after all it’s 25 years-old now), Tron was about a computer programmer who gets sucked into a virtual world and forced to fight in his own video games. In 1982, the special effects used in Tron were groundbreaking. It was the first movie to use computer generated images (CGI) in conjunction with live action. Sources also say that visual effects personnel, for many of whom Tron was an inspiration to enter the business, are already are jockeying to work on the film. Before Disney green lighted Lisberger to make the original film, he had to shot a test reel, financed by the studio, of the deadly Frisbee battle. It looks like Kosinski will have to do the same thing, but this time the studio wants to see a test sequence involving the movie’s Light Cycles. I can see why. The arcade game based on the Light Cycle scene was so popular in the early 1980’s that it earned more money than the movie. Fantastic! Good news for 80s cyberpunks everywhere. If we didn’t have Tron, then we wouldn’t have The Matrix (excluding the sequels), and then where would we be? I just hope they don’t drop the ball on this one. Oh no! Please no remakes any more – I was so disappointed about the re-make of Dr.Who. Most remakes NEVER meet the original! 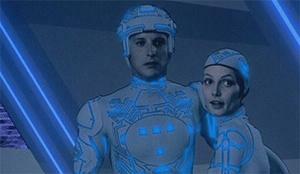 Tron was one of those films that cemented my slide down the path to Sci Fi fan. It will be very interesting to see whether the new film lives up to the original – so often remakes and sequels are just a disappointment, but not always. The first Tron movie was the first movie to mostly use computer animation throughout it. It is the forerunner of the cgi movies we have today. Watching the remake will be an awesome experience.